Louisville, KY (September 10, 2013) – Kentucky farmers are busy harvesting crops across the state – and that means drivers are more likely to encounter slow-moving farm equipment on the roadways. The staff of Kentucky Farm Bureau urges motorists to slow down and share the road this fall, especially as we celebrate National Farm Safety & Health Week, September 15-21. During this time of year farmers often need to move equipment from one field to another, but sometimes those transitions require their machinery to travel down or across public roads. When slow-moving vehicles enter areas normally traversed by fast-moving cars and trucks, accidents can occur. According to statistics from the Kentucky State Police, there were 180 collisions involving tractors and other farm equipment on Kentucky roadways in 2012. Of those collisions, 42 injuries and three fatalities resulted and the majority of the accidents (40%) were labeled by state police as the result of “inattention” – further proof that increased caution during harvest season is needed to prevent tragedy. In an effort to help prevent accidents with slow-moving farm equipment this fall, Kentucky Farm Bureau offers the following suggestions for both motorists and farmers. While each roadway encounter is unique, a general sense of awareness and caution will go a long way in keeping everyone safe and preventing tragedy. - Slow down and pay attention to the road. Radios, cell phones and even passengers can lead to distracted drivers and slower reaction times. Focus on the traffic in front of you and keep your vehicle within the posted speed limits, especially when traveling through areas where agriculture is prominent. - Watch for road signs. Many roads next to farms will have a yellow sign with the silhouette of a farmer on a tractor posted to warn drivers that they are entering an area where slow-moving vehicles are likely to be on the road. This should signal the driver to be on the lookout for farm equipment entering traffic. - Don’t assume the farmer knows you are there. While most farmers check frequently for vehicles approaching from behind them, their focus must remain on the road ahead. Keep your distance to ensure farmers can see your vehicle in their mirrors. Also remember that farm machinery is very loud and may prevent the operator from hearing your vehicle’s approach. - Keep your distance when following farm equipment. The triangular slow-moving vehicle emblem displayed on the back of farm equipment signifies that the machinery will not be traveling at high speeds and maneuverability is limited. Stay back and don’t tailgate. Additionally, if farm equipment pulls to the right side of the road, it does not necessarily mean it is making room for other vehicles to pass. It is quite possible that the farmer is slowing down and drifting right to gain extra room for a wide left turn. - Use extreme caution when passing. If you cannot clearly see what lies ahead of both your vehicle and the equipment you intend to get ahead of, do not pass. Never pass farm equipment when approaching a hill or curve, and do not attempt to pass when you are within 100 yards of an intersection, bridge, railroad crossing or tunnel. - Be patient with the farmer. You are not the only one eager to get the farm equipment off the road and out of the way. Farmers must move their machinery carefully along roadways and have lower maximum speeds by which they can travel. When traveling behind these slow-moving vehicles, patiently wait for the operator to find an appropriate time to let you pass. Don’t assume this can be done at any time. 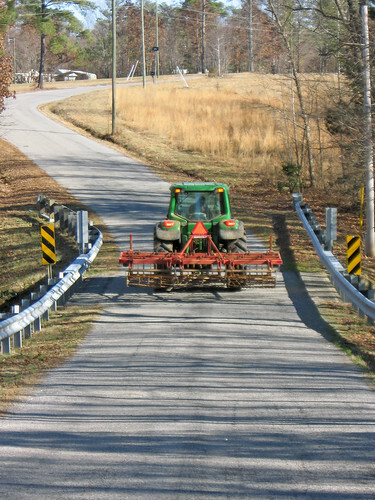 The farmer must survey the shoulder of the road for an area that is not soft, wet or steep and can support the weight of the equipment without causing it to tip. - Make sure the slow-moving vehicle sign is visible. This emblem is used to alert others of your speed and maneuverability capabilities, but doesn’t help if it is not visible. Mount it as high and as far left as possible. Also be sure to keep the sign clean and to replace it if it is no longer reflective. - Never post a slow-moving vehicle sign on a mailbox or fence post. Misuse of the slow-moving vehicle emblem can confuse motorists and eventually dull their sensitivity to the need to slow down when seeing one on machinery traveling down the road. Slow-moving vehicle signs should only be posted on appropriate equipment. - Keep flashing lights on. Use flashing lights on equipment to further draw attention to your slow speed. - Stay to the right. Keep farm equipment as far to the right edge of the road as safely possible, but stay on the road. Driving with equipment half on and half off the road might encourage a motorist to attempt passing before it is safe. - Make intentions to turn well-known. Collisions between farm equipment and other vehicles on the road commonly occur when a slow-moving vehicle is attempting to turn. Use turn signals or the appropriate hand signal to indicate turns. If the operator is using flashing lights, switch those off when approaching a turn so that the trailing vehicles know more clearly where the equipment is headed. - Avoid encouraging a motorist to pass. While it might seem courteous to wave someone ahead of a slow-moving piece of equipment, the driver of the trailing vehicle must ultimately determine when he or she can safely pass. - When it is safe, pull over to allow traffic to pass. It is completely legal for farm machinery to drive on Kentucky roadways, but their bulky frames and slow speeds often cause backups in traffic. As shoulder conditions allow, find a place to safely pull over and allow trailing vehicles to pass. As the fall harvest increases the number of slow-moving vehicles traveling on the roadways, Kentucky Farm Bureau encourages all drivers to be patient and slow down. National Farm Safety & Health Week may be scheduled for just September 15-21, but safe habits on Kentucky’s roadways are always in season.